Tommy and Shelby recently appeared at Canada's Yuk Yuk's. 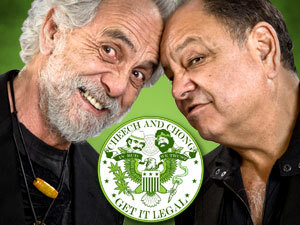 The Calgary Sun sat with Tommy to discuss prison, the Cheech and Chong reunion film and his return to That 70's Show. Following the hit off-Broadway run, Ideal Entertainment Group and Magic Arts & Entertainment are bringing THE MARIJUANA-LOGUES starring TOMMY CHONG to cities across the North America beginning February of 2005. Chong, best known for his legendary contribution to American counterculture in the comedy team Cheech & Chong, will continue with THE MARIJUANA-LOGUES, a stage show written by Arj Barker, Doug Benson and Tony Camin and directed by Jim Millan. It's an evening of side-splitting humor that has a nation buzzing. Chong lights up the live theater stage with his unique perspective on life. (Disclaimer: This production does not glorify drug use. Rather, it illustrates that cannabis culture is a thing of substance, humor and creativity.) From hazy to highbrow, THE MARIJUANA-LOGUES proves that the stories surrounding the bud are as varied as those who indulge. Purchase tickets here. note: for some reason, ticketmaster put different locations under each link. A host of celebs came out this morning for the Bob Hope Classic golf tournament. The Edmonton Sun spoke to Chong regarding the death of Johnny Carson. During the interview, he says that Cheech and Chong tried to get on the Tonight Show numerous times, but that Carson wouldn't have them on because of their image. Cheech Marin and a host of other celebrities will be participating in this year's Bob Hope's Classic golf tournament. The event takes place at a number of golf courses January 24-30. Yuk Yuk's comedy club January 29th. We first told you about this flick on 2001. Originally titled You'll Never Wiez In This Town Again, Pauly Shore's latest effort, Pauly Shore Is Dead is coming to DVD Jan 25th. The premise...Pauly loses everything he owns and decides to fake his own death. Needless to say, he gets caught. The cast list is AWESOME. Most of the actors play themselves including Tommy Chong, Tommy Lee, Jerry Springer, Jaime Bergman of Howard Stern's Son Of The Beach, Ben Stiller and more.